Stella Lopez, age 88, of Pleasanton, passed away Friday, April 5, 2019 in Pleasanton. She was born, Wednesday, August 20, 1930, in Pleasanton to Frank and Elena (Tejada) Lopez. 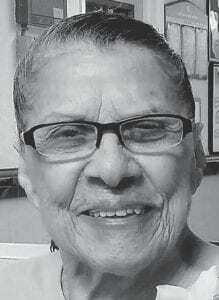 She is survived by her brother, Juan Jose Lopez, and numerous nieces and nephews. Stella was preceded in death by her parents; son, Mario Lopez; brothers, Frank, Santos and Fred Lopez, and sisters, Fina Flores, Josie Mejia, Terry Hernandez and Mary Helen Garcia. Visitation will be held on Thursday, April 11 at Hurley Funeral Home, 118 W Oaklawn Road in Pleasanton from 2-9 p.m. with a Rosary to be recited at 7 p.m. Funeral Mass will be celebrated on Friday, April 12 at St. Andrew Catholic Church, 626 Market Street in Pleasanton at 10 a.m. Interment will follow in San Ysidro Cemetery in Pleasanton.